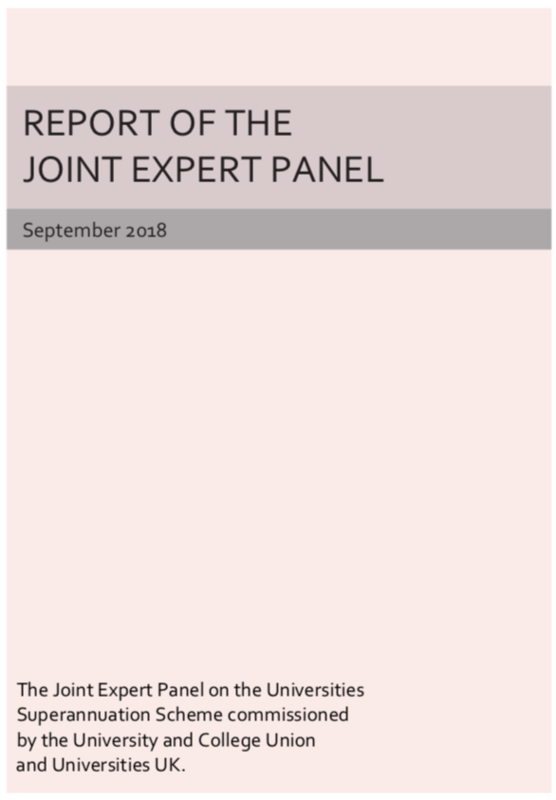 Yesterday, the long-awaited report from the Joint Expert Panel was released. You can read the executive summary here , and the full report here. The report very much validates many of the arguments that UCU and activists have been rehearsing over the last year. Given the fact that the Panel was made up half of employer representatives and half of UCU representatives, it is perhaps notable that the conclusion are more in line with what UCU and First Actuarial have been arguing for many years than the statements we have seen from employers. The JEP considered the manner in which the USS trustees use the ‘three tests’ to weigh up the affordability of contributions, and conclude that “too much weight” has been given to the long-controversial ‘Test 1’ which was now acting as a ‘constraint’ on benefit design and investment strategy, rather than guiding those decisions. The Panel state that USS had not given enough weight to the fact that our pension scheme is a large, cash-flow positive scheme and that the ’strength and diversity’ of the Higher Education sector was not always fully taken into consideration. Had the trustees and employers given these factors greater weight, the Panel argue, they should have been able to agree a less restrictive attitude toward risk. Specifically, the way the trustees had applied the employers’ ‘risk appetite’ using ‘Test 1’ had contributed to the ‘strong risk aversion’ we saw arise last year. Speaking of the Pension Regulator, the JEP state that it appears to have approached the valuation without taking full account of the specificities of the USS such as the long-term nature of the scheme and its ‘immaturity’ (more coming in than going out). The Panel was critical of the ‘framing and context’ of consultation questions put to employers in 2017, and how these informed ‘misleading results’ ending with an outcome that seemed ‘inconsistent with many employers’ wishes’. “The Panel believes that there are a number of different paths that the Trustee could adopt to reduce the contribution rate to below 30%” while maintaining the Defined Benefit status quo (and the Defined Contribution status quo but without the 1% match). In short, if these recommendations might be followed to the letter, our pension benefits as they are might be retained, with only some small detriment (the loss of the 1% employer match) for a small increased contribution to the scheme. On the usual basis of cost sharing, we might expect an increased employee contribution of 1% on these grounds. All of this is now still to be agreed. While this very strong validation – which directs criticisms at USS, tPR and UUK, but not at UCU – is causing optimism around the sector, we still now rely on the mechanisms of negotiation between UCU and UUK to finalise the matter of the 2017 valuation, upon which any change to our contributions and to our pensions in retirement now lie. In the meantime, the USS is obliged to continue to assume the increases in contributions to start in 2019, as previously announced. That can be overturned, and something near the status quo might prove to be the consequence of our dispute, but this report in itself does not signal a victory or end to the dispute.